Patricia Harman has spent over thirty years caring for women as a midwife, first as a lay-midwife, delivering babies in cabins and on communal farms in West Virginia, and later as a nurse-midwife in teaching hospitals and in a community hospital birthing center. Patricia Harman still lives and works with her husband, Ob/Gyn Thomas Harman, in Morgantown, West Virginia at their clinic, Partners in Women’s Health Care. 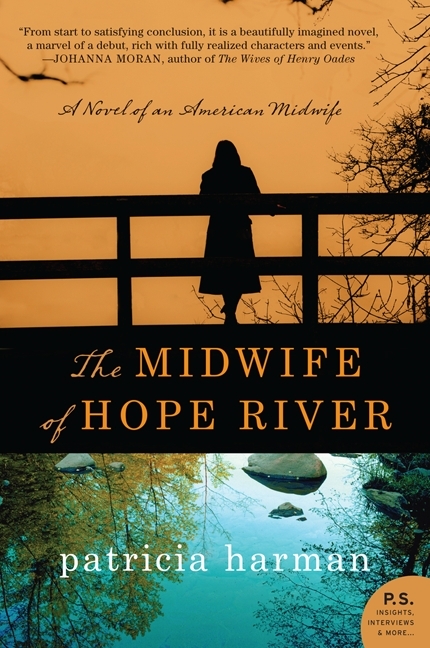 The opening scene in The Midwife of Hope River presents a dark and scary view of birth. Do you think most women (and men) see birth that way, or do they look forward to childbirth as a peak experience? How do you feel about childbirth? Have you ever lost a baby or known anyone who has? Living without electricity was an ordinary part of rural life in the 1930s. We are so used to all our conveniences now. How would you feel about living without them? Unions played a big part in Patience’s life and an important part in U.S. history. What is your experience with unions? Have you ever been a union member, or has anyone in your family? What place do unions have in modern times? Most people think of inhabitants of Appalachia as Caucasian. Did it surprise you to read about African-American miners? What did you think about the developing friendship between Bitsy and Patience? Realistic? A stretch of the imagination? Have you ever had a servant in your home? What was your relationship to them? The author writes of Patience’s loneliness, living out on the farm without Mrs. Kelly or her Pittsburgh community of radical friends. Do you think you could make it alone like that? What do you think the book says about the human capacity to endure hardship, loneliness, and fear? Patience tells us of her grief and guilt over having killed her husband accidentally while trying to get the goon off him at the Battle of Blair Mountain. The experience defined her life for many years, yet she couldn’t talk about it. How can a person let go of something like that? How important is it for a person to find someone to talk to?